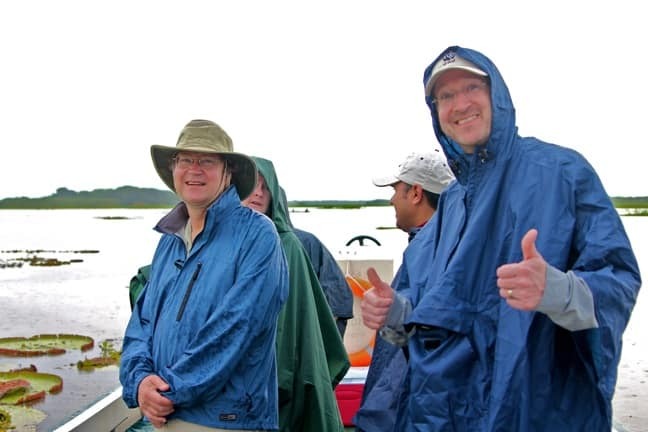 Our second full day in the Amazon on our International Expeditions River Cruise started at the crack of dawn, as we left on our skiffs for an early morning birdwatching expedition on a small tributary of the Ucayali River. We saw dozens of species along the way, but the light was largely too low (or the birds too far away) for good photos, even with my 400mm lens. 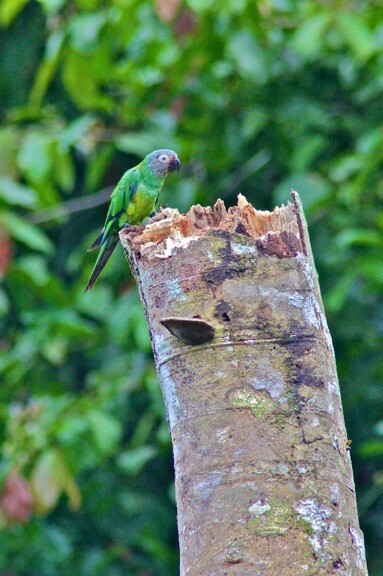 But this gorgeous Dusky Headed Parakeet proved remarkably cooperative, posing atop a stump near the water. This juvenile Black Crowned Heron was equally photogenic. 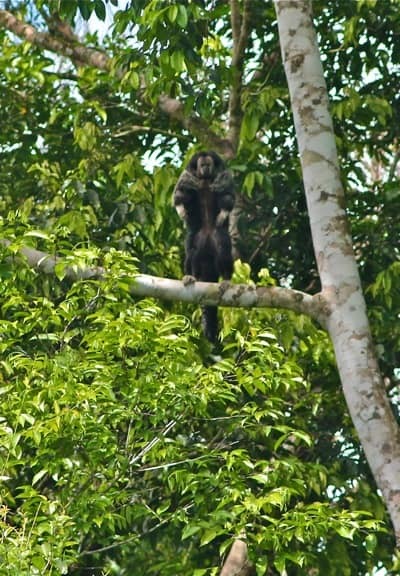 He appeared to be keeping an eye out for an early morning fish, sitting in branches just a few feet about the creek’s water, which was black from the tannins accumulated as it made its way down from the Peruvian Andes. I was mesmerized by the color of his brilliant orange eyes, just as he seemed to be mesmerized by the clicking and beeping of our cameras. 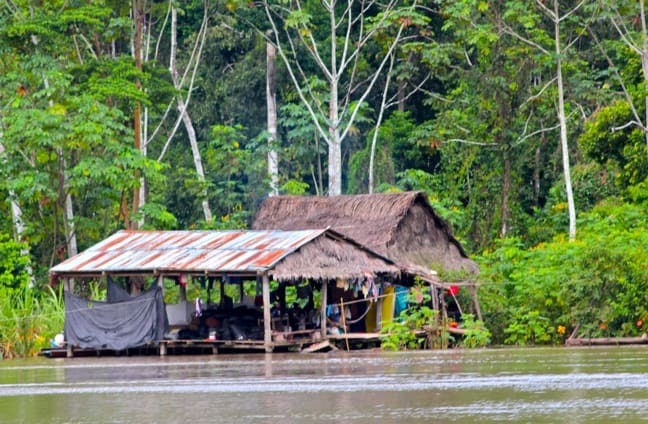 As we made our way deeper into the Amazon rainforest, we saw fewer and fewer signs of human habitation, which made the sighting of a Ribereños home seem all the more incredible. Located many miles from the nearest town, with nothing but a dugout canoe for transportation, these “river people” lived and worked in harmony with nature, fishing and harvesting local fruits to feed their families and building floating houses or houses on stilts to avoid flooding when the river’s waters reached their annual high of 40 feet or more. This shot is a great example of a simple Ribereños home. We’ve never seen more birds of prey (in terms of different species or sheer quantity) than we saw every single day we were in the Peruvian Amazon. Owls, falcons, hawks, caracaras, vultures and osprey seemed to be everywhere. 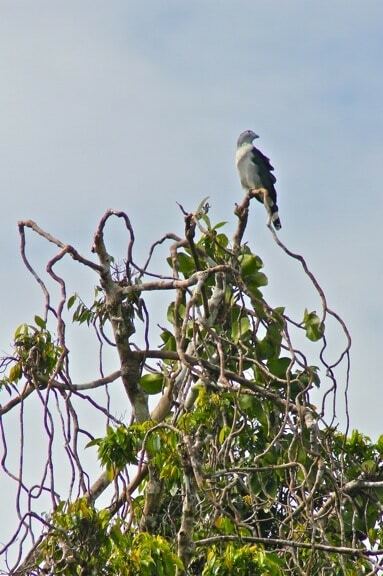 The beautiful bird is the Grey-Headed Kite, a raptor species found in open woodland and swamp-like forests ranging from eastern Mexico and Trinidad down to Peru, Bolivia and Argentina. This guy was clearly on the hunt (for reptiles and frogs), and his profile against the blue sky was as distinctive as his call, a mewling keow. Unlike in the Galapagos Islands, Amazon wildlife seems to have a healthy fear of humans (perhaps because many of them have historically been hunted for food), scrambling away anytime our skiffs got a little too close for comfort. So any time we DID get within 20 yards or so, the encounter felt incredibly special. As I stood up in the bow of our boat to get the shot, this handsome juvenile green iguana (check out the vivid colors of his spikes!) took notice of us immediately, and we were only able to squeeze off two quick shots before he made his escape. In our last major wildlife encounter of the morning, we were treated to the rare sight of two primate species side by side. The little fella on the bottom is a Squirrel Monkey, and this is literally the only one of the dozens we saw in the Amazon who wasn’t skittering around like crazy. 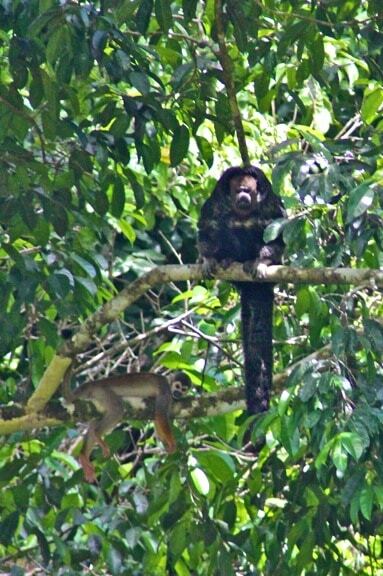 The big, bushy tail belongs to a Equatorial Saki Monkey, whose range includes much of northern and central South America. Sakis are fairly small, but their thick fur coats make them look a little like the pimps of the monkey world. It was really incredible to see these two species co-existing peacefully. Saki Monkeys are generally very shy and cautious, living and sleeping in the rainforest trees and leaping from branch to branch in search of fruit. But this guy immediately took an interest in our boat, and apparently felt threatened enough by our presence to stand up on his powerful hind legs to check us out. The moment provided an awesome view of his muscular form, and the hooded fur that made him look a little like a man in a monkey suit. After we made our way back to the Aquamarina for lunch and our daily siesta, I quickly realized I wasn’t feeling well. At first I thought I was just tired from too much sun and sweat, but when Montezuma’s Revenge kicked in I wondered if perhaps it was something more. Soon there were chills, rapidly spiking fever, and a near-delusional dizziness that I later realized was some sort of dehydration/heat stroke! I was really bummed to miss our afternoon trek out to Yuracocha Lake, which is connected to the river by a small stream, but fortunately Mary was able to get some killer shots. 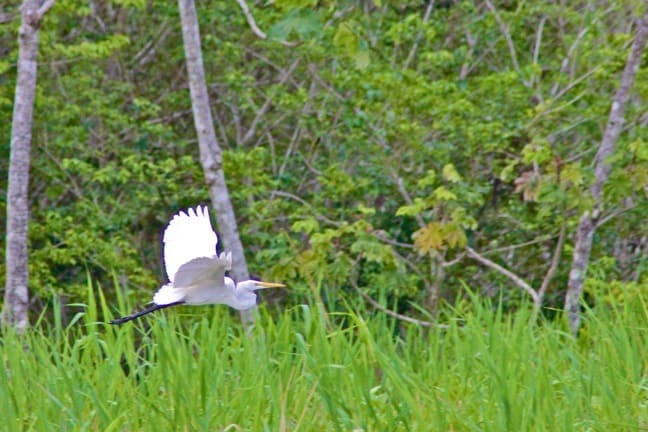 This Great Egret in flight was one of my favorites, with its vivid white feathers providing a stark contrast to the verdant green forest, which was darkened by foreboding rain clouds. 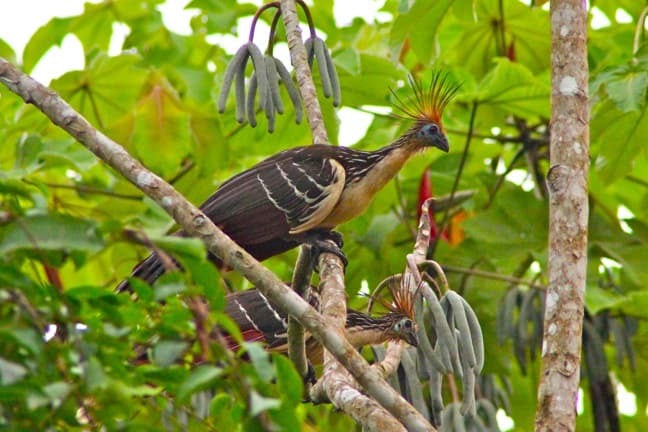 The worst part about not feeling well enough to go on the Caro Lake excursion was missing out on our one and only opportunity to see the distinctive species known as the Hoatzin (a.k.a. Canje Pheasant). 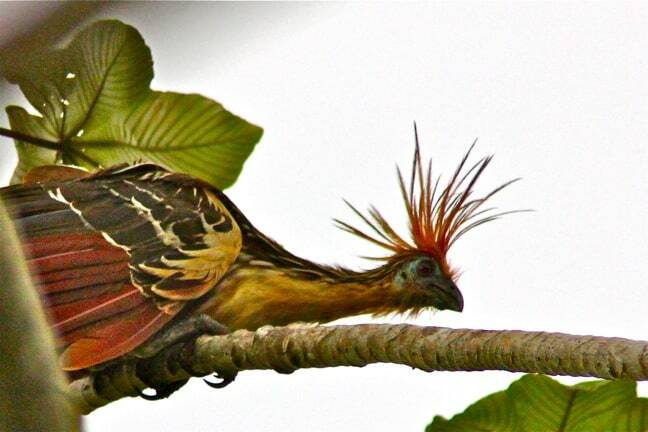 Found only in the swamps and riverine forests of Amazon and the Orinoco delta, the Hoatzin’s DNA makes them genetically enigmatic, and there has been intense scientific debate about its evolutionary connections to other bird species. The pheasant-sized bird, whose chicks possess claws on two of their wing digits, is often called the Stinkbird due to the manure-like odor caused by its unique digestive system. Locals also refer to the hoatzin as the Punk Rock Bird, and Mary’s killer close up shot makes it easy to see why: With its brilliant blue face, maroon eyes, and a spiked orange crest that looks a little like a mohawk, this bird is one leather jacket and a few dozen safety pins shy of fitting in at a Black Flag concert circa 1984. 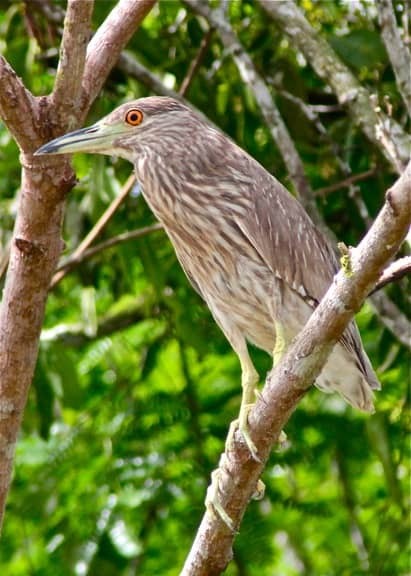 Their noises are just as odd as their appearance, making a bizarre variety of groans, croaks, hisses and grunts that are often associated with body movements, such as wing spreading. 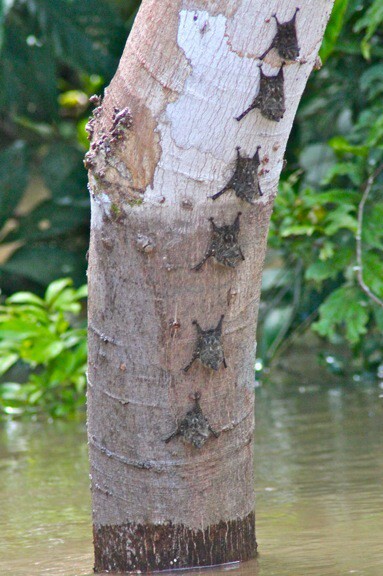 This is a truly a freaky looking/smelling/sounding species, and missing the chance to see them was the only major downside of my Amazon adventure. We tend to focus most of our photographic attention on people and wildlife when we travel, but the Peruvian Amazon was full of fantastic flora as well as fauna. 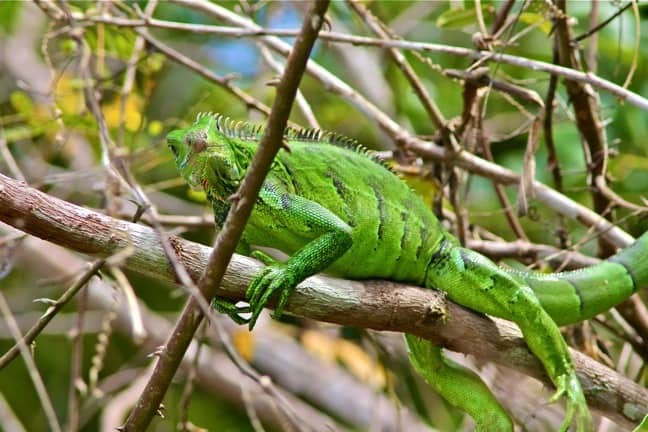 From the mustard yellow flowers of Rosewood trees and vast patches of purple Morning Glories to vivid red Passion Flowers and the huge green pods of Ice Cream Fruit, the plants of the Amazon were just as colorful and spectacular as the wildlife. 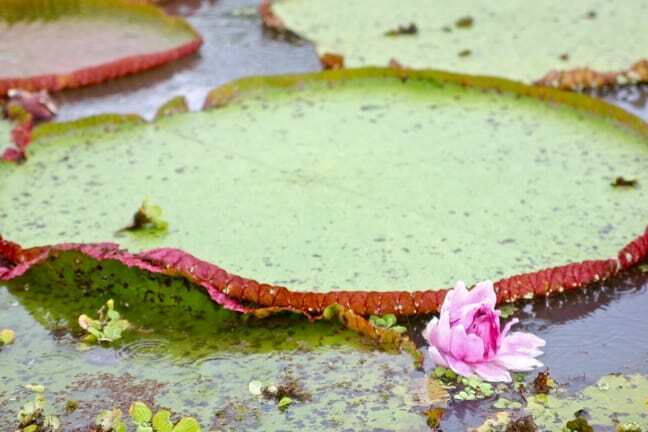 We obviously didn’t stop for them nearly as often, but Mary was able to get a great shot of these massive 3-foot wide lilypads, which were dotted with gorgeous pink Water Lilies.